Countering All India Students' Association (AISA) and National Students Union of India (NSUI) march on Wednesday, Akhil Bhartiya Vidyarthi Parishad (ABVP) students on Thursday launched a protest march at Delhi University’s North Campus seeking a ban on ‘anti-nationals’. 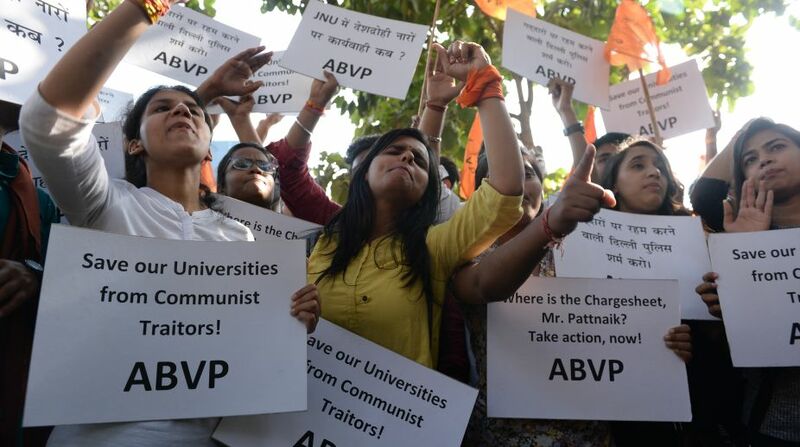 Chanting slogans and waving the tricolor, ABVP carried out the ‘Save Delhi University’ protest on Thursday. The ABVP said the protest march has been planned for bringing back peace in DU, according to sources. The campaign ‘Save DU’ used by ABVP is somewhat similar to AISA and other Left organisations used during their campaign. Other general students who did not belong to any unions also joined the march on Tuesday to protest against the alleged campus violence by ABVP members. According to reports, AISA is likely to plan a counter rally on March 4. AISA and NSUI have blamed ABVP for the February 22 violence at Ramjas College where many students and professors were injured. Ramjas College witnessed violent clashes between members of the ABVP and the AISA. The ABVP carried out the protest against an event invite to Jawaharlal Nehru University (JNU) student Umar Khalid, accused in sedition case last year for an event in the college.